In one of the senior quarter-finals of the d’Orsi Trophy in Lyon, Australia played Sweden and this astonishing board was played in the middle of the second segment. In this room Gumby stood no chance at all to make the contract when Bjerregård led the eight of spades North winning with the jack and shifting to the ten of clubs. Declarer won with the king and could note the queen being played from South. 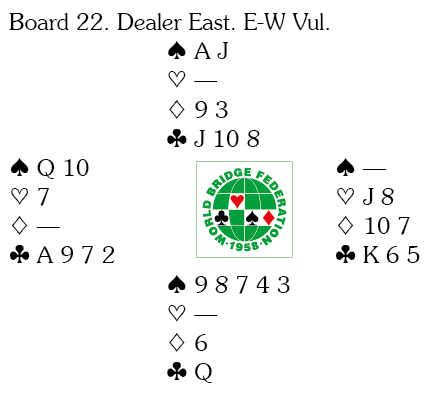 Declarer tried a diamond to dummy’s king and North took the ace and safely exited with the six of spades. Declarer ruffed, cashed the ace and king of trumps, noting a loser in hearts also existed. He cashed the queen of diamonds and cross-ruffed diamonds and spades. But there was no way of escaping from the loss of a trump and a club for one down. 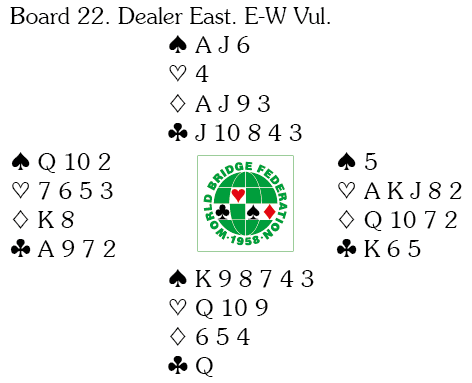 Far more interesting was the play in this where Brown led the five of diamonds that went to the eight, jack and declarer’s queen. It now looks like an easy game if trumps are 2-2. Declarer cashed the ace and king of hearts to learn that this wasn’t the case when North pitched a club on the second round. Declarer stand no chance making the contract if South now exits with the queen of clubs, but Brown didn’t do that. He exited with the eight of spades that went to the ten and jack and declarer ruffed with the eight of hearts. He went into the tank, thinking over the situation and realised that if he ruffed a diamond he would win another trick but still lose a club in the end for one down. He never concluded until it was far too late that he should have given up that ruff and instead cashed his jack of hearts to squeeze North in three suits. That would have been a very elegant, but odd, way to lose one but gain two tricks. Now it was just another “boring” push, rarely noticed by anyone!